High-profile apps include Yelp, Walgreens, news apps from Flipboard and the New York Times, and travel apps from TripAdvisor, Uber, United Airlines, British Airways, and Lyft. Smarthome control is possible through apps for Nest thermostats and Philips Hue lightbulbs. Some of these are available immediately through the Fitbit iPhone app, but others —such as Nest and Uber —are only due in the coming weeks and months. In 2018 on-device music options will grow to include Deezer, though like Pandora, listeners will need a paid subscription. The Fitbit OS update incorporates three new watchfaces —Levels, Threads, and Mountainscape —and one new first-party app, Fitbit Leaderboard. This lets people check their stats against friends and family, and offer taunts or encouragement, much like the Activity app on the Apple Watch. Previously, Ionic owners had to turn to their phone or computer for social functions. Fitbit has also worked to speed up the Ionic's interface, and improve Fitbit Pay by letting people switch between cards on-device. An absence of apps has been one of the primary criticisms of the Ionic so far. When it launched in October, only three third-party titles were available: Pandora, Strava, and Starbucks. 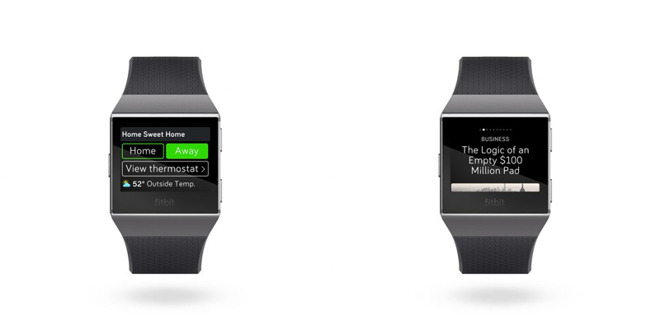 Even with Fitbit's improved selection, the Apple Watch still has many more apps.